Isaac ‘philivey2694’ Haxton and Viktor ‘Isildur1’ Blom will resume their SuperStar Showdown high stakes game at PokerStars today following the postponement on Sunday of the original match when the American’s internet connection became unstable. The match will resume at 18:00 GMT (Greenwich Mean Time) today with Malta-based Haxton – whose home was hit by storms and record-setting rainfall last weekend – just over $99,000 down after 692 hands had been played between him and the sensational Swede. 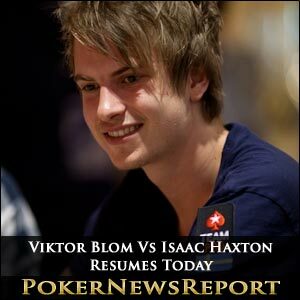 That leaves 1,808 hands still to be played, so Haxton will most certainly be aiming to turn the tables on 21-year-old online poker specialist Blom in an event that sees the stakes doubled to $100 and $200 after both players put up $300,000 to take part in four tables of No-Limit Hold’em. Poker fans can follow all the action at PokerStars in what is a rematch following their first encounter in December of 2010, when Haxton – who has the nickname of The Lizard King – won $41,701 from the inaugural SuperStar Showdown. Malta was well and truly battered over the weekend, with one person sadly losing their life as many homes were destroyed on the Mediterranean island. At the time, Haxton said: “I am really sorry about all this. I know it’s ruining the flow of the match for spectators. Meanwhile, another American pro who quit the States to continue playing poker online – following the events of Black Friday last April 15 – is Phil ‘MrSweets28’ Galfond. One-time World Series of Poker (WSOP) bracelet winner Galfond has placed his apartment in New York on the market and has now moved to Canada to continue his high stakes online charge, with last week proving very profitable for the Vancouver-based pro. The 27-year-old – who pocketed $817,781 for winning the WSOP’s $5,000 buy-in Pot-Limit Omaha with Rebuys event in 2008 – made his return to the virtual felt by securing a profit of $767,000 from 118 sessions at the world’s biggest poker room, PokerStars. Blom, meanwhile, also remained in the black – even though Galfond profited from him – with more than $250,000 earned, while the enigmatic RaiseOnce ended the week up by $494,000 and Englishman Gavin Cochrane pocketed a $250,000 profit. However, MaiseE was not so lucky, ending the week down by nearly $469,000 as the biggest loser, while Finnish star Jens Kyllonen – who lost $340,000 – still remains this year’s biggest winner so far as he is more than $1.5 million in profit.